Morocco's Central Bureau for Judicial Investigations said on Saturday the Swiss-Spanish national was suspected of "teaching some of those arrested... about communication tools involving new technology and of training them in marksmanship". The Swiss-Spanish national followed an "extremist ideology", the statement said. Hundreds across Morocco have attended vigils for the two women. 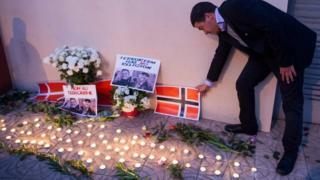 Image caption Many participants came with signs saying "sorry"
In the capital Rabat a minute's silence was held with Danish and Norwegian diplomats present, while hundreds more people attended a vigil in the southern village of Imlil, near where the women's bodies were found. Ms Jespersen, who was 24 and from Denmark, and 28-year-old Norwegian Ms Ueland had been studying outdoor activities at the University of Southeastern Norway. They had arrived on a month-long holiday in Morocco on 9 December and had travelled to the foothills of Mount Toubkal, North Africa's highest peak, 10km (6 miles) from Imlil. Their bodies were found in their tent. Both women had taken full precautions ahead of their trip, Maren Ueland's mother said.